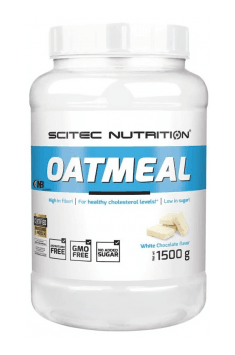 Scitec Oatmeal is a delicious wholesome snack in the form of rolled oats. A high content of nutrients and fibre as β-glucans ensures a healthy and high-energy meal. Oatmeal is one of the healthiest wholegrain meals with high nutrient density. It contains numerous vitamins, minerals, antioxidants and beneficial fibre. Adequate intake of these nutrients brings many health benefits. It is a group of substances which are not digested. This allows them for residing longer in the digestive system and that is why they bring a lot of benefits. The most important substance from this group, which is found in the oat grain, is β-glucan. Even though it is not digested, it dissolves partly in the intestines, thereby forming a gel-like substance. Such substance has various health benefits. Among other things, it is capable of binding cholesterol and therefore helps remove its excess from the body. This contributes to lowering total cholesterol levels. Consuming an adequate amount of this nutrient ensures healthy cardiovascular function. By lowering total cholesterol and LDL cholesterol levels, it protects blood vessels from the formation of atherosclerotic plaque which contributes to the development of dangerous diseases. Furthermore, fibre stimulates the secretion of bile acids which are rich in cholesterol. It contributes to decreasing the concentration of this compound in the body. Due to a high iron content, oat flakes improves haemoglobin synthesis. It is the pigment of erythrocytes and has regulates oxygen exchange in the body. The content of avenanthramides lowers blood pressure. This antioxidant exerts a stimulating effect on the production of nitrogen oxide which induces the relaxation of blood vessels. Due to fibre content, rolled oats stay longer in next sections of the digestive system. This causes slower release of carbohydrates from the blood which prevents their sudden leap in the body. This protects from hyperglycaemia and promotes health of diabetics. In addition, nutrients from oatmeal improves insulin sensitivity and that is why it regulates blood glucose levels. It is an important factor which prevents sudden drops in energy throughout the day. Oat grains contain a lot of antioxidants (avenanthramides) and polyphenols. This helps protect immune cells from harmful activity of free radicals and reduces inflammation in the body. The main difficulty during the reduction period is constant hunger. This is due to the fact that we do not provide enough food which leads to decreased secretion of satiety hormones. Rolled oats contain fibre which swells up in the digestive system and consequently stimulates the secretion of these hormones. This helps reduce effectively the appetite. Slow release of carbohydrates due to low glycaemic index of rolled oats ensures unflagging energy levels. In addition, the presence of B vitamins affects mitochondrial energy production and allows you for training harder with less fatigue. Oatmeal with white chocolate flavour is delicious rolled oats with enormous nutrient density. One portion of the product contains a high amount of beneficial substances which influence positively many aspects of the body functioning. It is a perfect solution for individuals who have little time for preparing a wholesome meal. A low glycaemic index, which characterises the product, should interest individuals who have a problem with carbohydrate balance and reduce body fat mass. Take one serving (150 g) with 400 ml of water. It is best to eat oatmeal in the morning or during day between meals. The use of the product depends greatly on the adopted food model. Carb-back loading forces yourself to use the product in the evening. The situation is similar in the case of Low Carb High Fat (LCHF) diet in which main macronutrients throughout the day are proteins and fats. However, the time of eating oatmeal is not so important to individuals who consume predominantly carbohydrates. To enhance the taste, it is recommended to mix rolled oats with milk. Rolled oats are an amazing meal which can be modified in many ways. When they are combined with fruits, they are a great snack. As an ingredient of cakes and other meals, oats help also increase their nutritional value. Unflavored: Oat Flour 80% (Gluten), Oat Flakes 20% (Gluten). White Chocolate: Oat Flour 76% (Gluten), Oat Flakes 19% (Gluten), Flavor (White Chocolate), Sodium Chloride, Thickener (Xanthan Gum), Sweeteners (Sucralose, Acesulfame K). Chocolate praline: Oat Flour 76% (Gluten), Oat Flakes 19% (Gluten), Flavor (Chocolate Praline), Fat-reduced Cocoa Powder (10-12%), Sodium Chloride, Thickener (Xanthan Gum), Sweeteners (Sucralose, Acesulfame K). Banana: Oat Flour 76% (Gluten), Oat Flakes 19% (Gluten), Flavor (Banana), Sodium Chloride, Thickener (Xanthan Gum), Sweeteners (Sucralose, Acesulfame K). Coconut: Oat Flour 76% (Gluten), Oat Flakes 19% (Gluten), Coconut Shreds (2%), Flavor (Coconut), Sodium Chloride, Thickener (Xanthan Gum), Sweeteners (Sucralose, Acesulfame K).